MEXICO CITY, Apr 17 2014 (IPS) - Making international cooperation more effective requires a civil society with greater influence in the negotiations of the development agenda that the world’s governments are to adopt in 2015, civil society representatives said at an international meeting in Mexico. The first High-Level Meeting of the Global Partnership for Effective Development Cooperation (GPEDC) was held Apr. 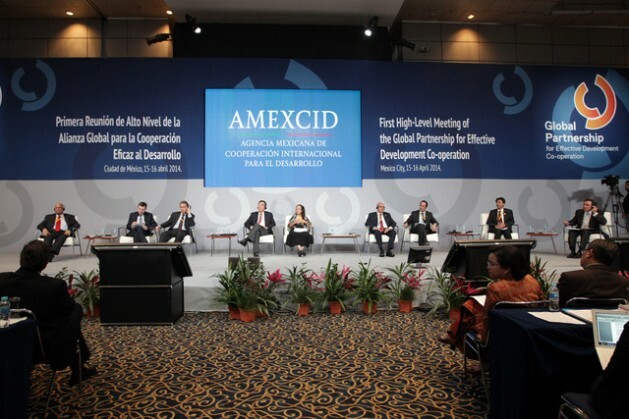 15-16 in the Mexican capital, where civil society organisations demanded that a human rights focus be incorporated in international development aid flows. At the gathering, the GPEDC also called for international cooperation to include a more enabling environment for civil society organisations (CSOs), as well as greater transparency and better accountability. “There are two key issues: preserving the Partnership, which is complex due to its plurality and diversity of opinions, and improving the monitoring of issues,” the executive director of Oxfam Mexico, Carlos Zarco, told IPS. The GPEDC, which brings together over 100 governments and non-governmental organisations (NGOs), emerged in Busan, South Korea in November 2011 with the aim of finding novel approaches to development aid. That aid is now flowing along new paths, such as growing South-South cooperation, with an expanding role of emerging nations as donors, and triangular cooperation, where one developing country cooperates with another, with financial support from a nation of the industrialised North. Against that backdrop, the United Nations members are negotiating the Sustainable Development Goals (SDGs), to be adopted in 2015 to extend and expand the Millennium Development Goals (MDGs) agreed by the international community in 2000, which have only been partially met. Three years after Busan, “There is a shrinking space for CSOs, with more restrictive policies. Governments choose which CSOs to consult with, there are limited public consultations with CSOs,” María Theresa Lauron, an activist with the Asia-Pacific Research Network, told IPS. Lauron said there was a growing trend to restrict access to information. She also mentioned new forms of financing that limit the effectiveness of NGOs, and growing pressure on CSOs that voice criticism, to get them to align themselves with the governments of aid recipient nations. The first high-level meeting of the GPEDC drew some 1,500 delegates of governments, academia, international agencies and civil society, who focused on issues like mobilising development aid resources at a national level, South-South and triangular cooperation, and participation by the business sector. At the start of the meeting, United Nations Secretary General Ban Ki-moon called for continued strategies of oversight, transparency and accountability and efforts to fight corruption, and said a strong commitment to reducing poverty was needed – a reference to the first of the eight MDGs, which is to halve extreme poverty from 1990 levels. CSOs complain that a portion of development aid goes to financing infrastructure works like large hydropower dams, gas pipelines and roads that violate the rights of local communities and generate conflicts in recipient nations. The principles established in Busan call for ownership and leadership of development strategies by aid recipient countries, a focus on results that matter to the poor in developing countries, inclusive partnerships among development actors based on mutual trust, and transparency and accountability to one another. They also emphasise the need for recipients of development aid to work together and form partnerships, to have a greater influence in designing development strategies, and to guarantee that the funds will be used effectively in projects. The report “An enabling environment for civil society organisations: A synthesis of evidence of progress since Busan”, which was analysed at the meeting, found practices that reduce social participation in international cooperation. It cited, for example, multiple, vaguely worded regulations; costly, complex procedures for registering organisations; vague arguments for not allowing an organisation to register; legal proceedings against activists critical of government policies; and blocked access to international financing. One example is Bolivia, one of the 12 countries studied in the report. The “Pilot study on Enabling Environment Bolivia” found that there were leaders of social organisations questioning the work of NGOs and their role as intermediaries in the management of resources, as well as government criticism of NGOs for supposed meddling in projects. “The calculating position of some NGOs in response to the risk that the current government will accuse them of being traitors or of opposing the process of change, lead[s] them to silence their critical voice,” concludes the report by Susana Eróstegui of the National Union of Institutions for Social Action Work in Bolivia. These conditions, the report says, hinder the work of NGOs in the post-2015 agenda. For that reason, the GPEDC launched the Civil Society Continuing Campaign for Effective Development, which from now to the end of 2016 will work to assert the right of NGOs to participate in development policies. The goal will be to establish development aid policies that are clearly influenced by civil society’s positions on human rights, democratic ownership and inclusive partnerships, and global, subregional and regional dialogue to push for international standards on an enabling environment. During the high-level meeting, Mexico’s conservative President Enrique Peña Nieto presented an inclusive cooperation strategy, whose focus, IPS learned, would be a plan for Africa managed by the Mexican Agency for International Development Cooperation, seeking to emulate programmes that Brazil has carried out in Africa. One new phenomenon is that emerging economies such as Brazil, China and South Africa are taking on different roles in the field of development aid, and are reluctant to accept the same standards as those followed by traditional donors from the industrialised North. “There are many requirements for traditional aid, and none for emerging economies,” said Oxfam Mexico’s Zarco. “These have to accept standards” in terms of national ownership, transparency, accountability and inclusive development, he added. The Organisation for Economic Cooperation and Development (OECD) presented “Making Development Cooperation More Effective: 2014 Progress Report”, which found a slow pace of compliance with the Busan agreement and “mixed results”. “Much more needs to be done to transform cooperation practices and ensure country ownership of all development efforts, as well as transparency and accountability among development partners,” says the report, which is based on data from 46 countries that receive development cooperation. The report was drawn up under the auspices of the Global Partnership, which is jointly supported by the United Nations Development Programme (UNDP) and the OECD.